What's the difference between the Intermediate 1 and the Intermediate 2 Marathon Training Programs? A little bit of mileage, that's all. Runners who choose the latter run three 20-milers toward the end of the program instead of two. And there's a bit more mileage leading up to those 20-milers. Otherwise, the programs are basically the same. You would choose one or the other depending on how many marathons you have run and how your training has progressed. A logical progression would be to start with one of the Novice programs (1 or 2), move to Intermediate 1 for your next marathon and Intermediate 2 for the one after that. Or you may want to stay longer at each level before moving up. And you can even move backwards from Advanced. The choice is yours. 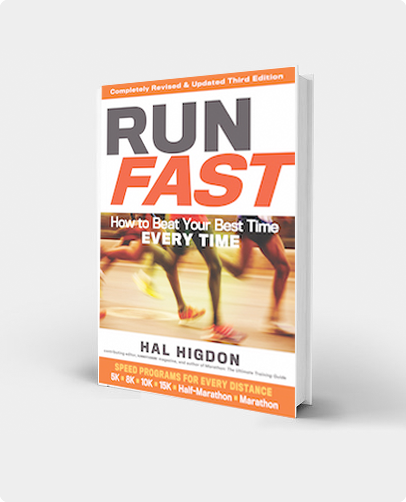 Each day, if you sign up for this program, Hal will send you emails telling you what to run and offering training tips. For more information, check out the Program Details below. This is Intermediate 2. The Novice 1 and Advanced 2 training programs in my Marathon Training Guide represent the extremes. The former programs are designed for runners running their first marathons, or experienced runners who are happy with that level of training and see no need to do more. The latter programs are designed for those very experienced runners, who have done a number of marathons, perhaps have plateaued in their times, and want to maximize their ability by training hard and incorporating speedwork into their training. In between, there’s a broad area for runners just like you! If you previously have trained using one of the novice programs (1 or 2), or Intermediate 1, you now can increase your mileage a bit, run some workouts at a faster pace, and seek improvement. Intermediate 2 offers a slight jump in difficulty from Intermediate 1. You begin in Week 1 with a long run of 10 miles instead of 8 miles. You thus get to 20 miles for your long run by Week 11, which permits a third 20-miler in Week 15. Midweek mileage is slightly higher, but instead of cross-training on the weekends, you get more serious about your running and do a second run of 5-10 miles, often at marathon race pace. You now do your cross-training on Mondays, instead of taking the day off. Incidentally, Intermediate 2 is the ideal training program for those doing the popular “Goofy” run at the Walt Disney World Marathon, where you run a half on Saturday followed by a full marathon on Sunday. This program’s 10-mile pace run followed by a 20-mile long run offers the perfect jumping-off platform for racing 13-26. Additional tips and instructions are available if you sign up for the interactive version, available through TrainingPeaks. Long Runs: The key to the program is the long run on weekends, which builds from 10 miles in the first week to a maximum of 20 miles. Although some experienced runners do train longer, I see no advantage in doing 23, 26 or even 31 mile runs. (I’ve tried that myself in the past, and it just wore me out.) Save your energy and concentrate on quality runs the rest of the week. Consistency is most important. You can skip an occasional workout, or juggle the schedule depending on other commitments, but do not cheat on the long runs. Notice that although the weekly long runs get progressively longer, every third week is a “stepback” week, where we reduce mileage to allow you to gather strength for the next push upward. Rest is an important component of any training program. 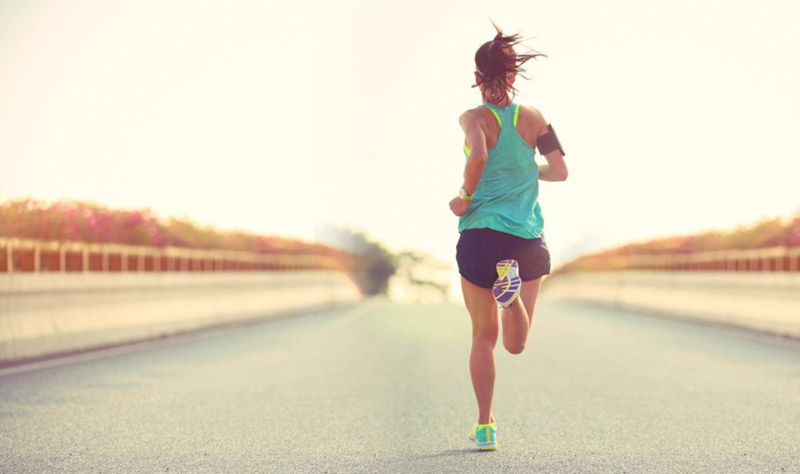 Run Slow: Normally I recommend that runners do their long runs anywhere from 30 to 90 or more seconds per mile slower than their marathon pace. This is very important. Listen to what the Coach is about to tell you! The physiological benefits kick in around 90-120 minutes, no matter how fast you run. You’ll burn a few calories and trigger glycogen regenesis, teaching your muscles to conserve fuel. Running too fast defeats this purpose and may unnecessarily tear down your muscles, compromising not only your midweek workouts, but the following week’s long run. Save your fast running for the marathon itself. There are plenty of days during the rest of the week, when you can run race pace. So simply do your long runs at a comfortable pace, one that allows you to converse with your training partners, at least during the beginning of the run. Have fun. Which brings up my next point. 3/1 Training: Toward the end of the run, if you’re still feeling fresh, you may want to pick up the pace and finish somewhat faster. This will convert your long run into what I call a 3/1 Run. That means you run the first three-fourths of your long run (say the first 12 miles of a 16-miler) at an easy pace, then do the final one-fourth (4 miles of a 16-miler) at a somewhat faster pace–though still not race pace. This 3/1 strategy is advised for only the most experienced runners, and I don’t recommend you do it more than once out of every three weekends. In other words: first weekend, easy run; second weekend, 3/1 run; third weekend, step back to a shorter distance. My philosophy is that it’s better to run too slow during long runs, than too fast. The important point is that you cover the prescribed distance; how fast you cover it doesn’t matter. Walking Breaks: Walking is a perfectly acceptable strategy even for intermediate runners, and it works during training runs too. While some coaches recommend walking 1 minute out of every 10, or walking 1 minute every mile, I teach runners to walk when they come to an aid station. This serves a double function: 1) you can drink more easily while walking as opposed to running, and 2) since many other runners slow or walk through aid stations, you’ll be less likely to block those behind. It’s a good idea to follow this strategy in training as well. (You may want to use a water belt if you don’t have easy access to water on your training course.) You will lose less time walking than you think. I once ran a 2:29 marathon as a master, winning a world title, walking through every aid station. My son Kevin ran 2:18 and qualified for the Olympic Trials employing a similar strategy. And Bill Rodgers took four brief breaks (tying a shoe on one of them) while running 2:09 and winning the 1975 Boston Marathon. Walking gives your body a chance to rest, and you’ll be able to continue running more comfortably. It’s best to walk when you want to, not when your (fatigued) body forces you too. Race Pace: What do I mean by “race pace?” It’s a frequently asked question, so let me explain. Race pace is the pace you plan to run in the race you’re training for. If you’re training for a 4:00 marathon, your average pace per mile is 9:09. So you would run that same pace when asked to run race pace (sometimes stated simply as “pace” on the training charts). If you were training for a 5-K or 10-K, “race pace” would be the pace you planned to run in those races. Sometimes in prescribing speedwork, I define paces for different workouts as 5-K pace or 10-K pace, but you won’t be asked to run this fast in the Intermediate 2 program. Cross-Training: Mondays in the intermediate programs are devoted to cross-training. What is cross-training? It is any other form of aerobic exercise that allows you to use slightly different muscles while resting (usually) the day after your long run. In this program, we run long on Sundays and cross-train on Mondays. The best cross-training exercises are swimming, cycling or even walking. What about sports such as tennis or basketball? Activities requiring sideways movements are not always a good choice. Particularly as the mileage builds up toward the end of the program, you raise your risk of injury if you choose to play a sport that requires sudden stopping and starting. One tip: You don’t have to cross-train the same each week. And you could even combine two or more exercises: walking and easy jogging or swimming and riding an exercise bike in a health club. Cross-training for 30-60 minutes will help you recover after your Sunday long runs. Midweek Training: Training during the week also should be done mostly at a comparatively easy pace. As the weekend mileage builds, the weekday mileage also builds. Add up the numbers, and you’ll see that you run roughly the same mileage during the week as you do during long runs on the weekends. Midweek workouts on Wednesdays build from 5 to 10 miles. There are similar slight advances on Tuesdays and Thursdays. The program is built on the concept that you do more toward the end than at the start. That sounds logical, doesn’t it? 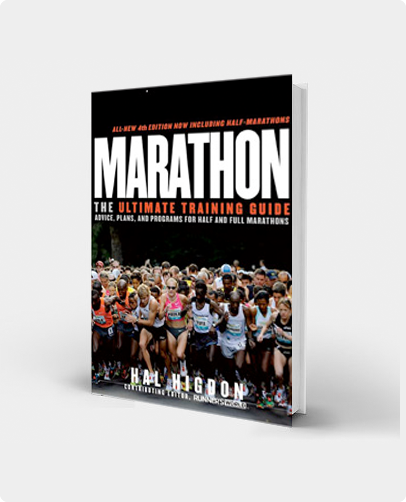 Believe me–as tens of thousands of marathoners using this schedule have proved–it works. Rest: Despite my listing it at the end, rest is an important component of this or any training program. Scientists will tell you that it is during the rest period (the 24 to 72 hours between hard bouts of exercise) that the muscles actually regenerate and get stronger. Coaches also state that you can’t run hard unless you are well rested. And it is hard running (such as the long runs) that allows you to improve. If you’re constantly fatigued, you will fail to reach your potential. This is why I designate Friday as a day of rest for intermediate runners. It allows you to gather forces for hard running on Saturdays and Sundays. If you need to take more rest days–because of a cold or a late night at the office or a sick child–do so. And if you’re tired from the weekend, take Monday off as well–or cut the length of your cross-training. The secret to success in any training program is consistency, so as long as you are consistent with your training during the full 18 weeks of the program, you can afford–and may benefit from–extra rest. Speedwork? There is no speedwork involved in the Intermediate 2 program. If you feel you need speedwork to improve, check out the advanced training schedules, which offer hill training, interval training and tempo runs on different days of the week. Normally, however, I recommend that marathoners save their speedwork for times of the year when they are not doing a marathon mileage buildup. Check the shorter-distance training programs elsewhere on this web site for more on that. Modifying the program: My training programs are not carved in concrete, and you can make appropriate changes based on your experience, or to suit your convenience. One frequent request made by runners using my forums is to modify the order of the weekend runs, particularly those who want to run long on Saturdays instead of Sundays, because that’s when their friends do their long runs. Running with friends is certainly more fun than running alone, but the pace runs are placed on Saturdays ahead of the long runs on Sundays for a purpose. The main reason is to tire you out a bit in the first workout Saturday so you are not tempted to do the second workout Sunday too fast. It is also difficult to hit race pace on Sunday the day after a draining long run. Some runners ask if they can split these two workouts, for example, running pace on Friday and long on Sunday. They can, but it defeats somewhat the purpose of two “hard” workouts back to back on Saturdays and Sundays. Most runners have more time for their training on the weekends. So modify the program if you want, but if you make too many modifications, you’re not following the program. I’m the kind of person that if there is a plan, I’l; stick to it. That’s why I love Hal’s training plans. I know that if I follow them each day, I’ll get to the start line , fit and ready for the challenge. Used this for my third marathon and pleased with the progress. Great that the plans now have a kilometre measure as well! Thanks again Hal, have crossed heaps of half marathon finish lines and three marathons, all under your programs. I used this training plan for years when I first got into running marathons. I found the three 20 mile runs in this plan were necessary to get my body in shape to qualify for Boston. That said, I could not reach my full potential using this plan as that requires additional speedwork. I used this plan for my first marathon last year. Finished in 3:35, which was only 5 minutes short of my goal. End results was a 3:40 at Chicago. I didn’t pay attention to the rules. I used this for my first marathon, and I was a non runner. I had been athletic throughout my life, but I’d only started trying to run long distance around march 2018, and I started this program mid may to prepare for a marathon on Sept 8th 2018. It was tough but I pushed through and finished my first marathon with a 4:30:00 time plus a few seconds. I posted almost all fo my results on my instagram page @nickppelletier This level may or may not be a right fit for you, but my methodology was, I need a plan and something simple as I wanted to get started running and I didn’t have time in my life to figure out all the details. All of Hal’s plans are simple to follow with no need for math or figuring out what to run each day, so I took it and just started running. It got the job done. I’m on my last week of recovering and then I’ll be running for another 10 weeks and then using this same plan again to prepare for the LA marathon with some added hills and speed work this time. I would use his plans because they are simple and take the thought process out of what do I run each day.